School starts in a week. Already we have lost one of our students, and the rest are finished work soon. That will leave only a few of us to do all the work of picking, packing & marketing the fruit & vegetables. But in the orchard, it looks like fall already too. 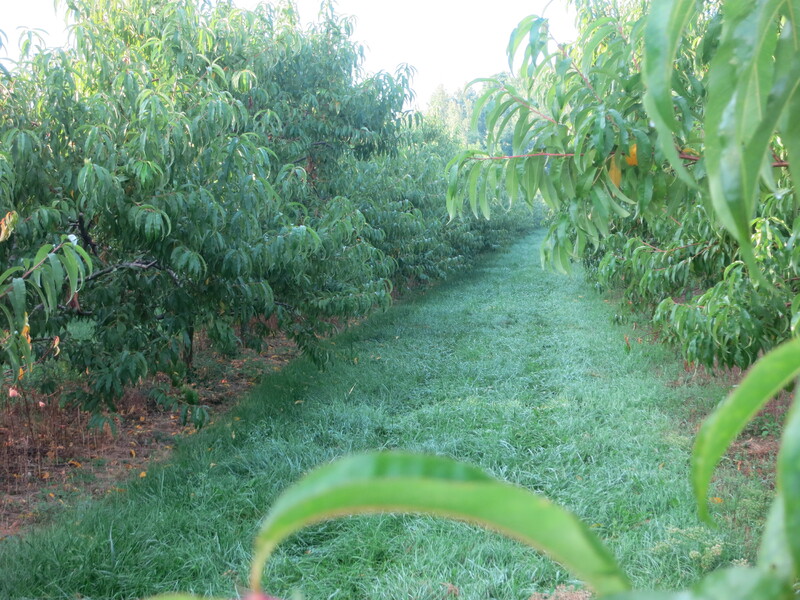 There are more rows of peaches picked, than rows with fruit remaining. But the peaches that are still ripening look great. 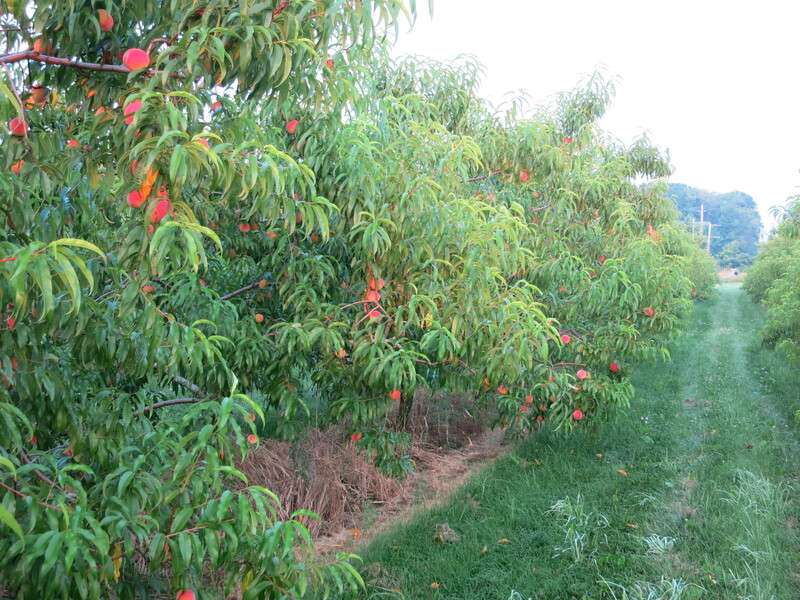 The last variety of peaches that will be ripe in mid-September, are just starting to show some colour. 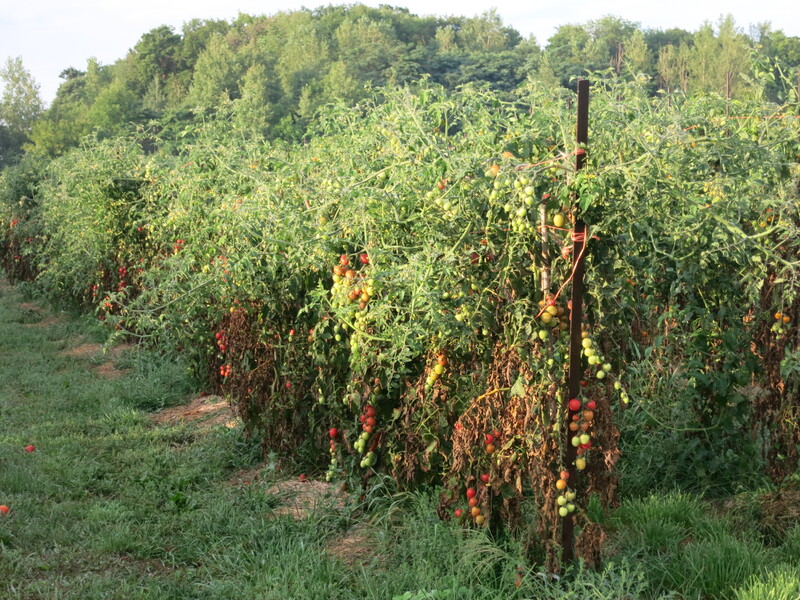 The tomato plants, while still yielding amazing amounts of fruit, are declining rapidly. 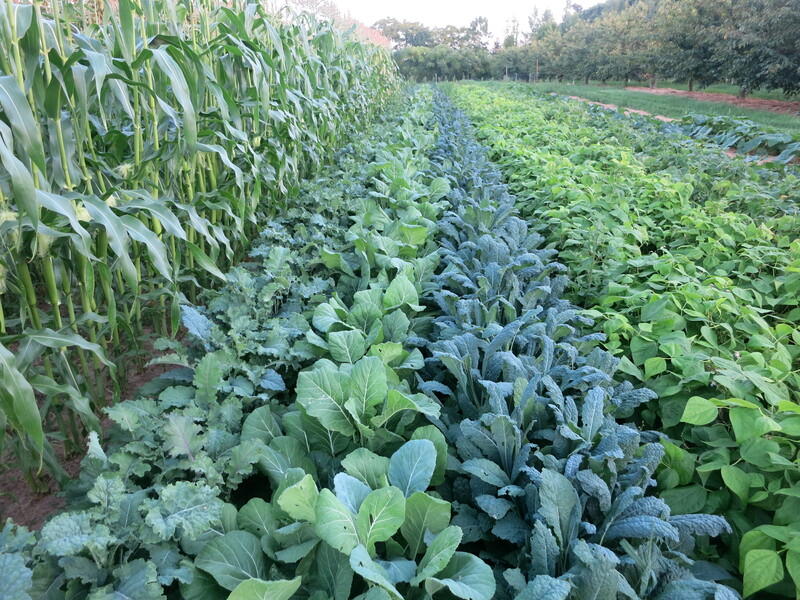 A new vegetable crop for us this year is collards. 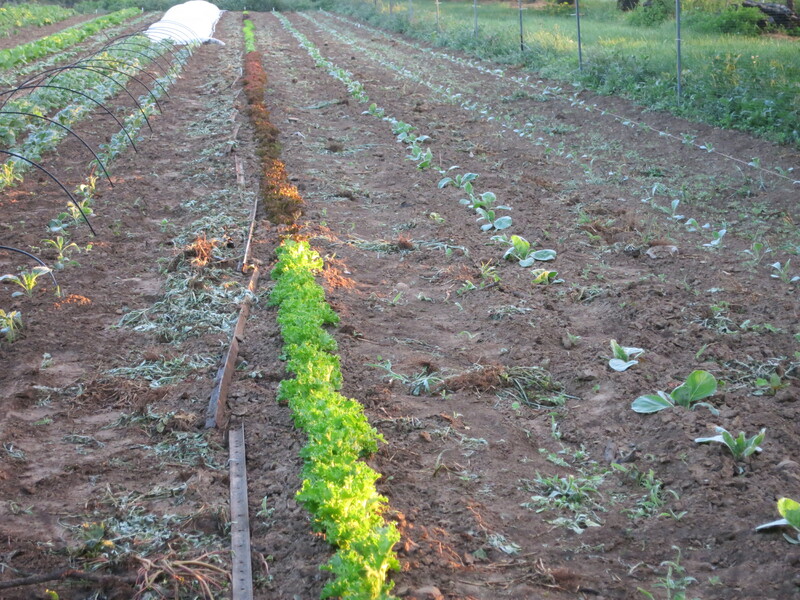 When some of the kale seed we needed was not available this past winter, we substituted collards in its place. 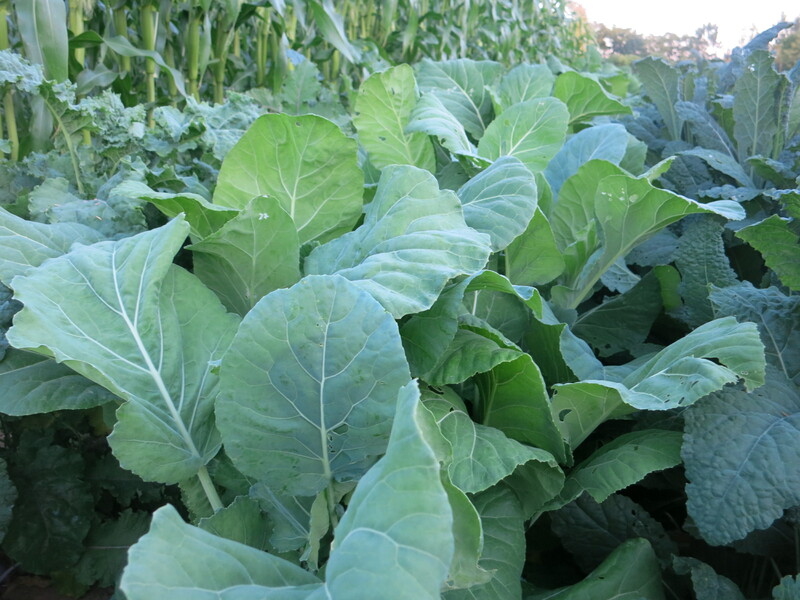 CSA members can expect collards in their share this week. Collard greens, blackberries, peaches, tomatoes, onions, sweet peppers. Collards or collard greens are usually associated with the southern USA. But, as we learned, they grow well in our area too. Collards are a nutritional goldmine, similar to kale & broccoli. They are low in calories, high in fibre, & rich in beta-carotene, vitamin C, calcium & B vitamins. They are rarely eaten raw, but are best prepared by boiling rapidly for 5-10 minutes which preserves nutrients, colour & taste. Then the collards are drained, dried & sautéed in a little oil with other vegetables or herbs & flavourings. Sauteing collards without boiling first is another cooking method. It results in slightly stronger flavoured greens with a chewier texture. We have included a simple collard recipe below. 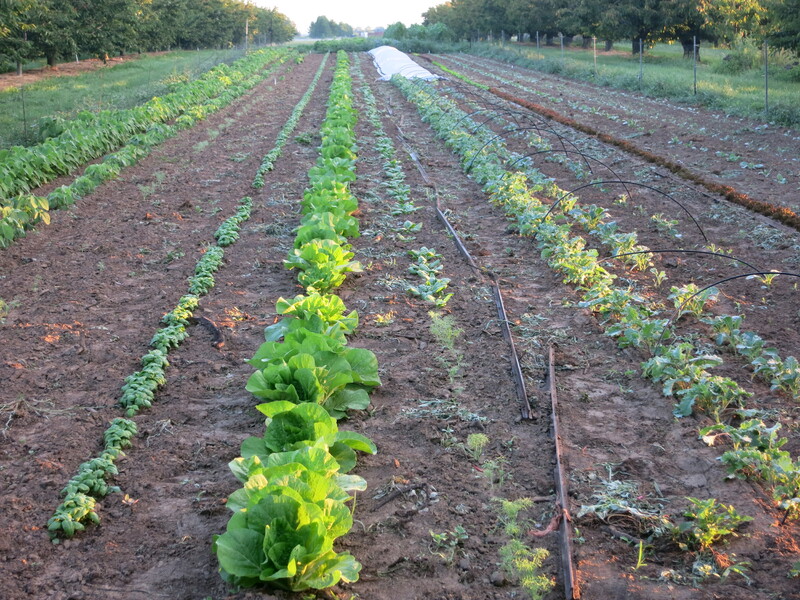 Let us know how you enjoyed your collards, so we can decide whether or not to grow them again. We are finally picking enough blackberries to offer a taste in your CSA share this week. Because the crop is light, it’s just a small taste. Don’t even pretend to take them home – just eat them in the car! Peaches – the flavour is even better on these later varieties. They do soften quickly, so keep them in the fridge. Tomatoes, onions, & peppers – We hope you continue to enjoy them. Eat them fresh, cook with them, or tuck them in the freezer to use this coming winter. Tomatoes can be frozen whole, onions minced & peppers chopped. Then just add them to soups, sauces or stews for a taste of summer. Thank you for remembering to return & reuse the boxes & containers! Given the choice, I’ll take a nectarine over a peach almost anytime. Maybe it’s the smooth skin without that peach fuzz, the beautiful red colour, or the firm yet juicy texture, but for whatever reason I prefer nectarines. I begin eating them when they are still green & weeks away from ripening, eat them all through the season, and scour the trees long after they are finished, hoping to find a forgotten fruit for one last, sweet, too juicy, taste treat. 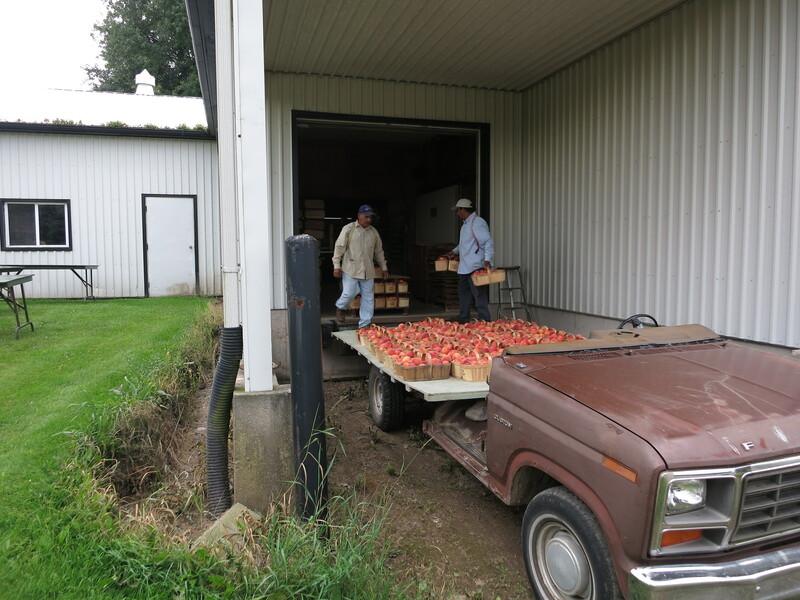 The first pick of our Harblaze nectarines was this past weekend. It was rather discouraging. In fact we debated whether we should even pick them. 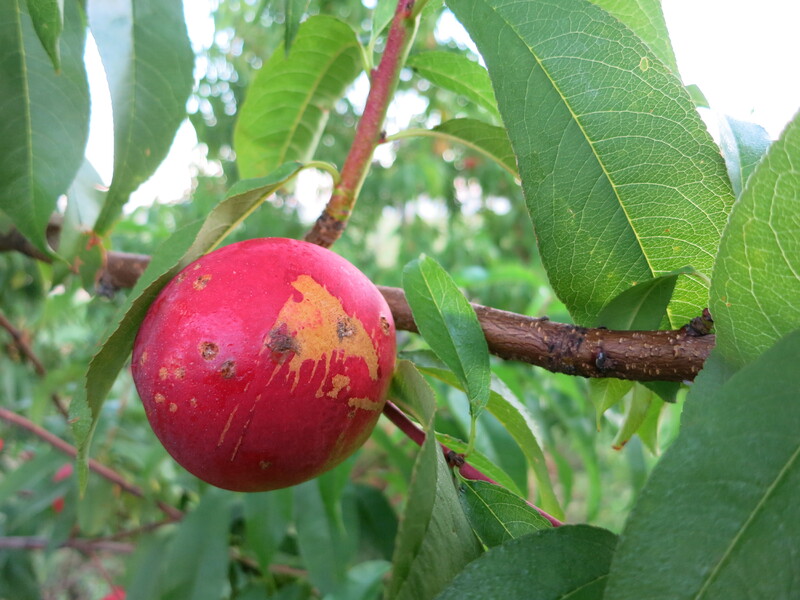 It seems that everything likes nectarines – and by everything I mean every bug, insect & disease. The fruit this season is really bug-bitten & ugly, too ugly to be sold as #1 nectarines. Approximately 95% is 2nd grade. Almost all the damage is on the surface though, so a quick peel leaves a clean nectarine. And of course they still taste amazing. They just look bad! It’s my fault. I must have got my timing wrong on a spray, or missed a needed pesticide. So we’re left with a lot of sub-standard nectarines. … lots of good eating for me, I guess! Nectarines, beets, beans, tomatoes, sweet peppers, onions. This week’s box contains nectarines instead of peaches. 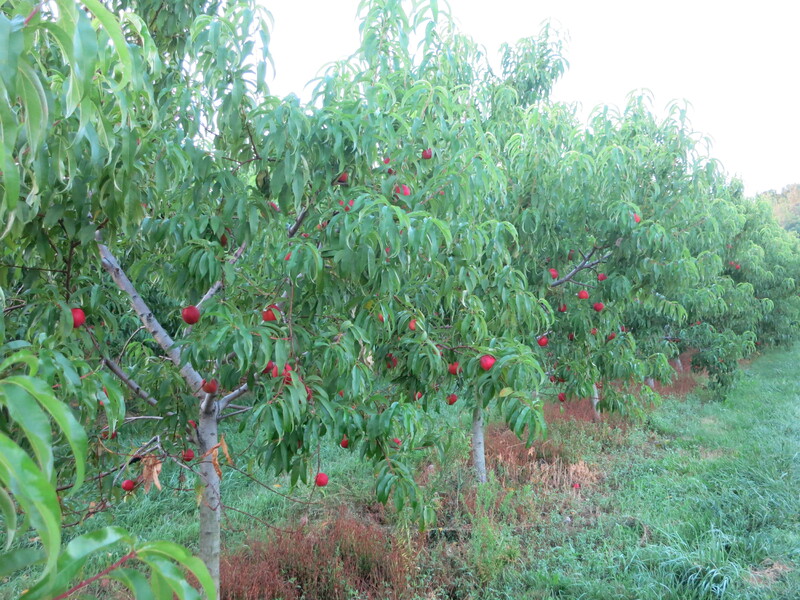 The cooler temperatures of last week slowed down the ripening of the peaches, but we have lots of nectarines. As described above, the quality is lacking, but not the flavour! It’s time to pick the beets. 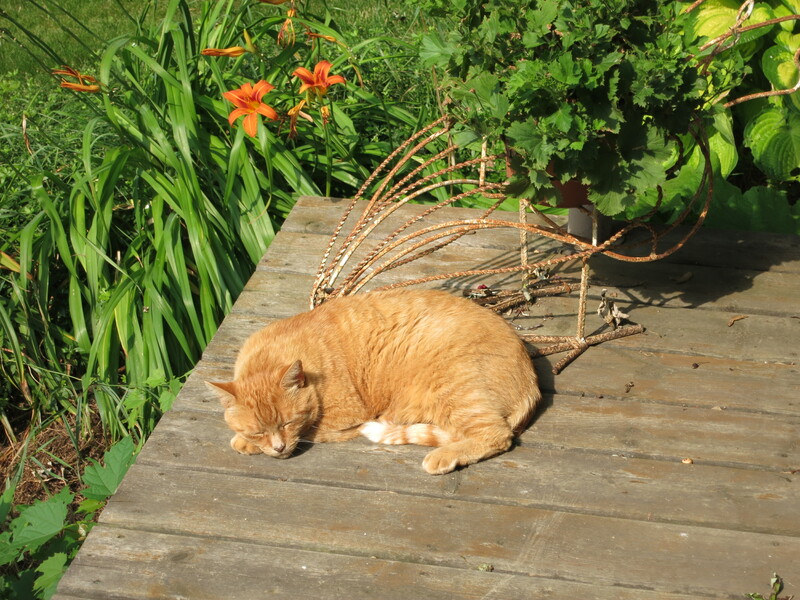 We have been waiting, to give them more time to grow, but the weeds are gaining the upper hand & we are choosing our weeding battles – beets is not one of them. There will be red beets & golden ones. The next patch of beans are ready, and they are looking good. Tomato lovers are in heaven these days. There are lots of delicious tomatoes in different sizes & colours to enjoy. Sweet peppers & onions are becoming a staple in your CSA shares. Some of the later vegetable plantings, growing nicely, including Chinese cabbage, cabbage, lettuce, edamame, beans, kohlrabi & kale. 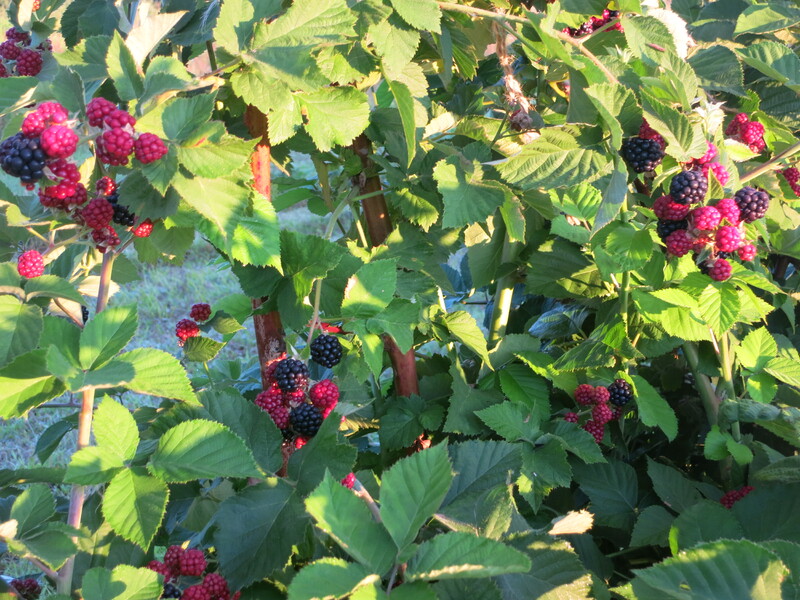 The blackberries are slowly ripening – we’ve picked a few pints so far. 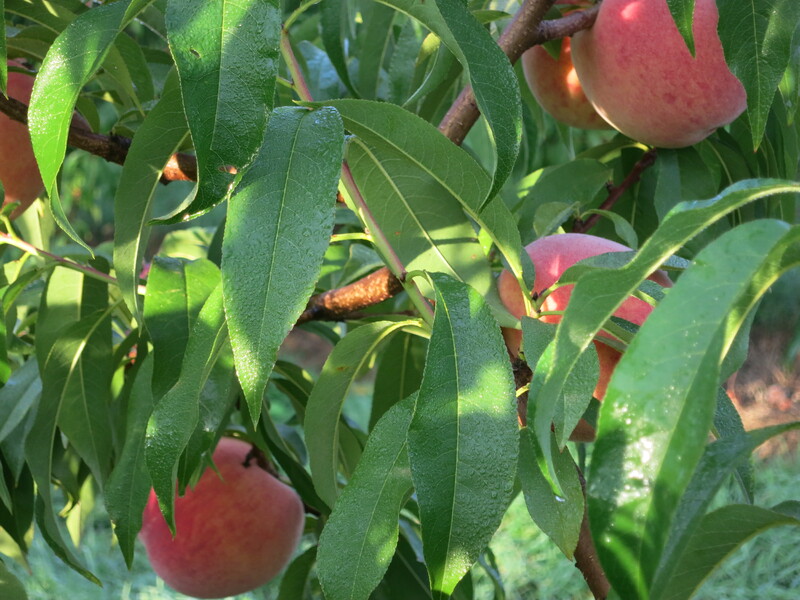 Of all our crops, peaches are the most anticipated – both by us and our customers. It seems everybody loves peaches! Peaches are also the most misunderstood crop we grow. 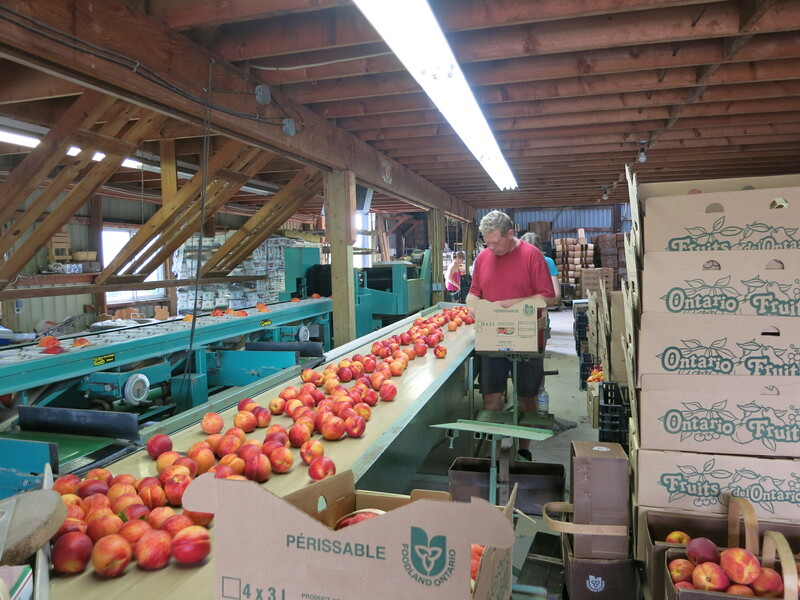 Peach season here in Niagara begins at the end of July or in early August, and finishes around the middle of September – depending on the weather. 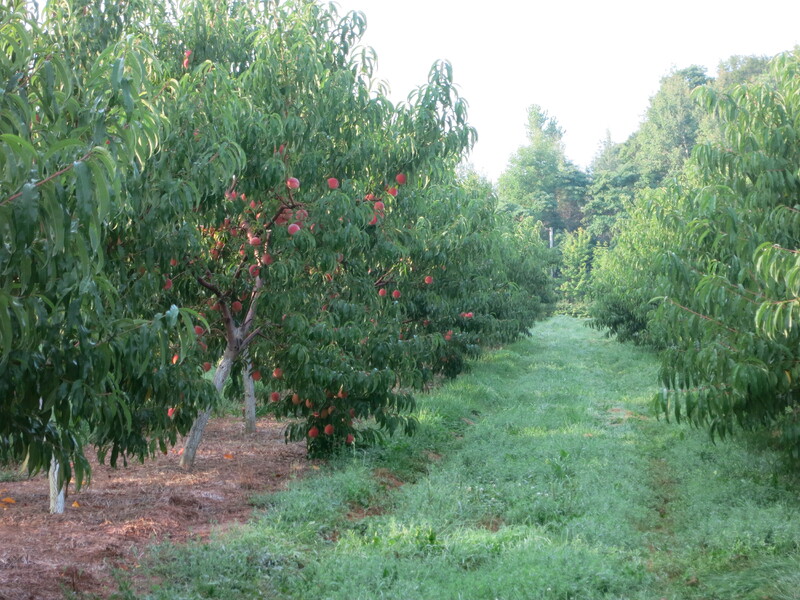 On our farm we grow 25 varieties of peaches. 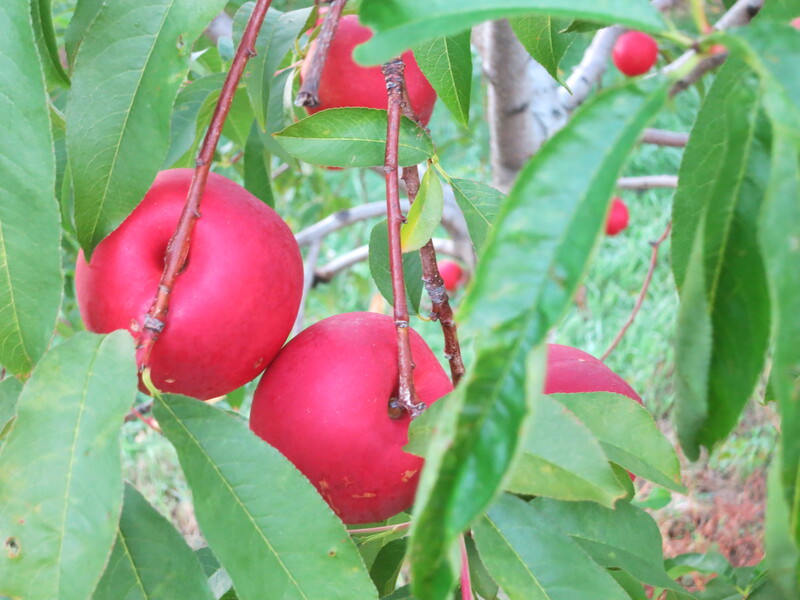 Each variety ripens at a different time, making for a longer peach season. 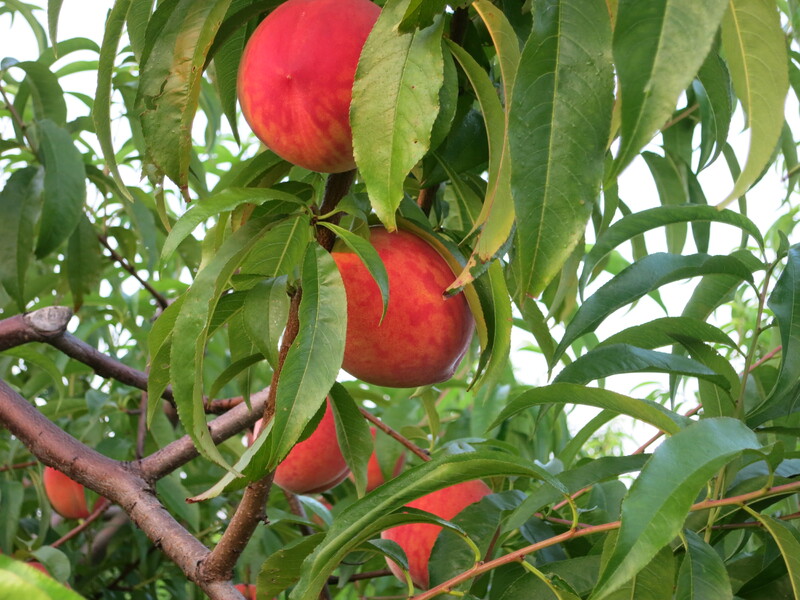 We pick a peach tree 3-5 times, usually every 2 or 3 days, choosing only the ripe, mature fruit each time. 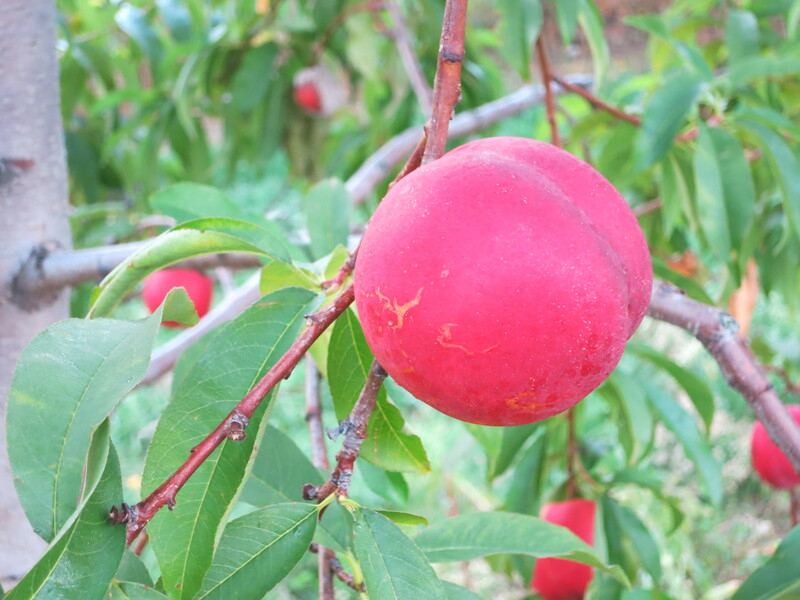 A ripe peach will have a yellow background, not green. It will still be firm but not hard. 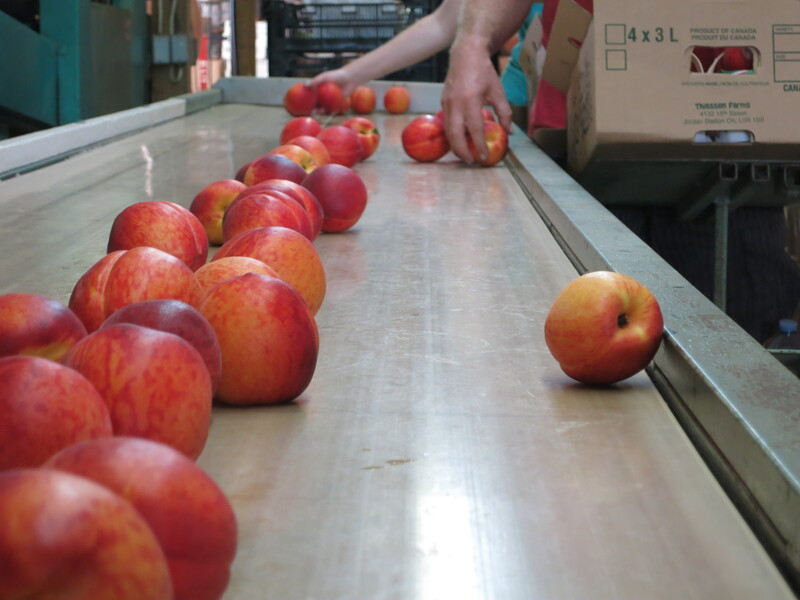 While a soft peach will be the ripest & sweetest, it will not stand up to picking, packing & shipping to market. A peach will continue to ripen & will soften if left at room temperature. It should only take a day or 2. Ripe peaches can be stored in the fridge without affecting the flavour. Each variety of peach has a name. It comes with this name – we don’t name it! The name often indicates the origin of that variety. 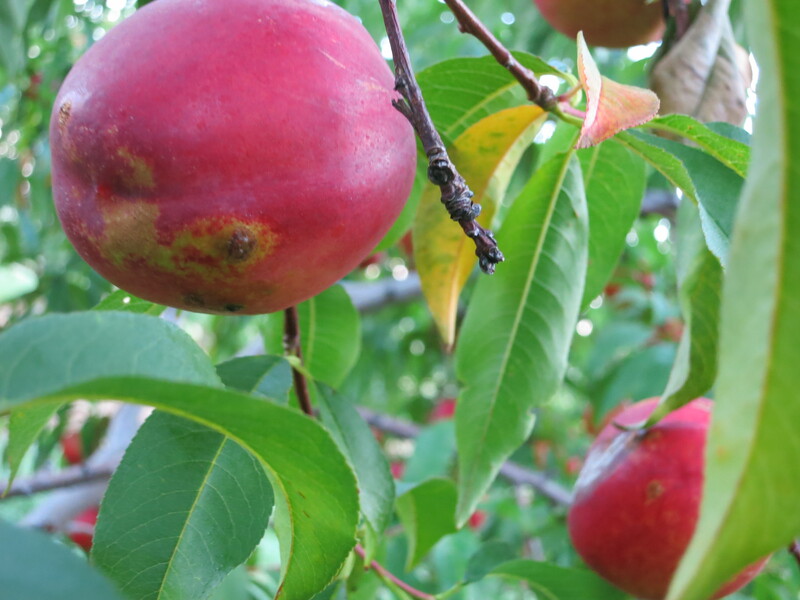 Peaches that were bred at the government-run agricultural research station at Vineland have names beginning with “V” such as Vivid, VeeBlush, Vinegold. Names beginning with “H” were developed at the Harrow Research Station (Harrow Diamond, Harrow Dawn, Harbrite… ). New Haven, Michigan is the home of Redhaven, Sunhaven & all the other “haven” peaches. 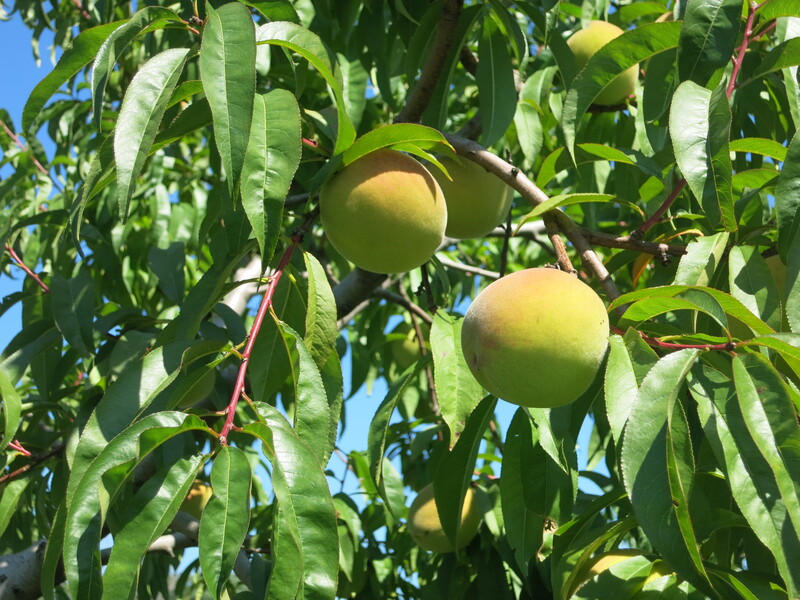 Lately, new peach varieties come from private breeding programs in Michigan including the “star” series of peaches (Starfire, Blushingstar, Coralstar …). 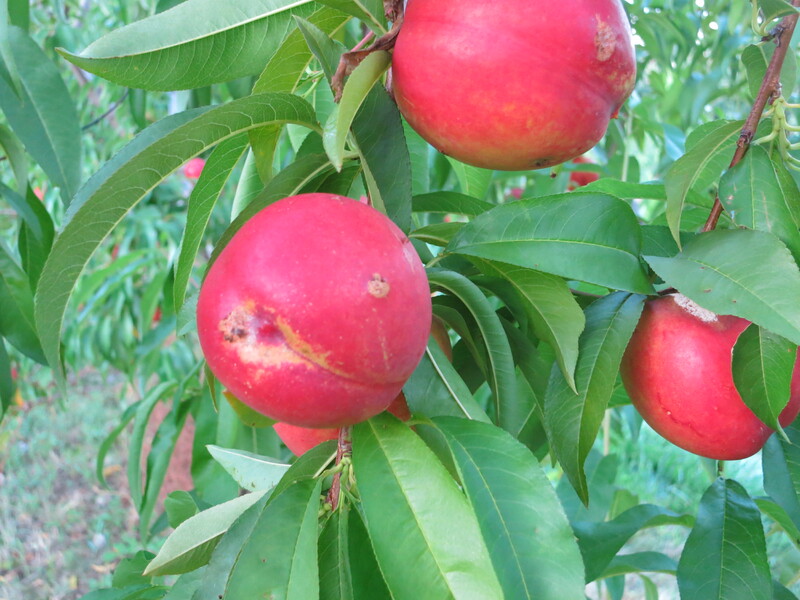 Redhaven is the most widely known variety of peach. This does not mean it is the best, or tastes the best, or even looks the best. To reject a peach simply because it is not a Redhaven means you are missing out on an abundance of good peaches. “Freestone” is not a variety of peach. Freestone means that the flesh of the peach is not tightly attached to the pit or stone. “Clingstone” means that the flesh is tight to the pit. 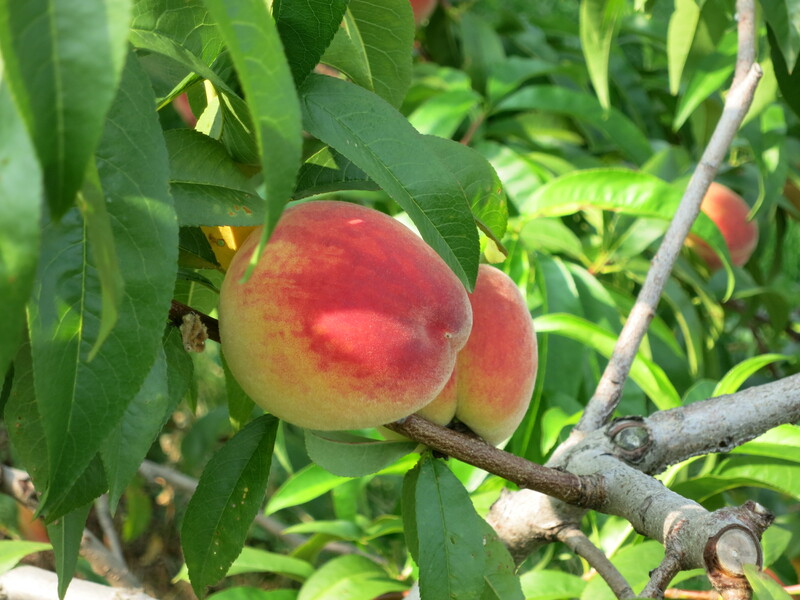 To reject a peach because it is not freestone means that you are missing out on an abundance of good peaches. Sure it is a bit more work to cut or chew around the pit – but it’s worth it! Most of the earlier peaches are clingstone. 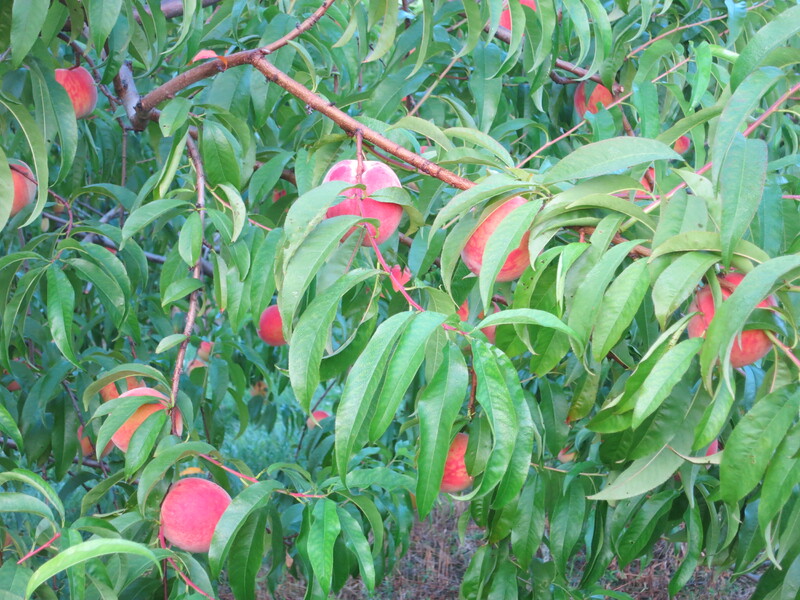 Peaches ripening from mid-August on are mostly freestone. 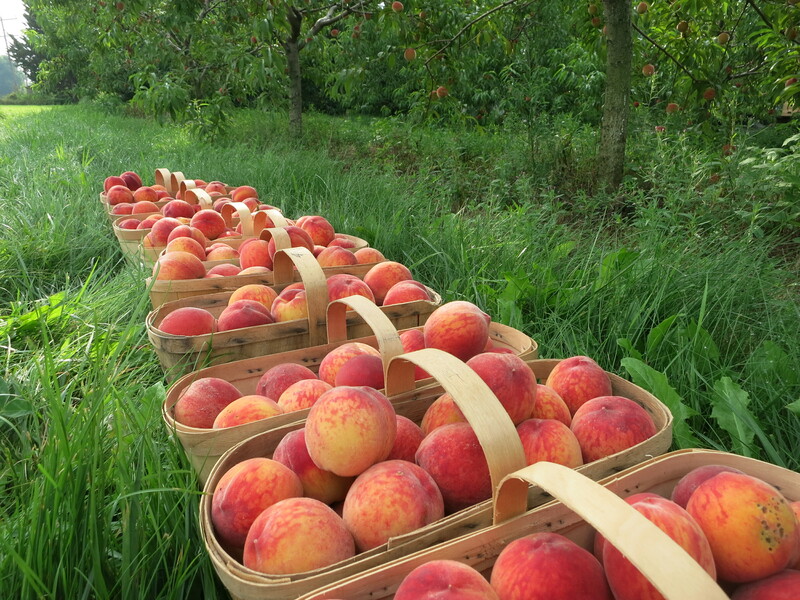 Most peaches grown in Ontario are for eating fresh, not for canning or processing. 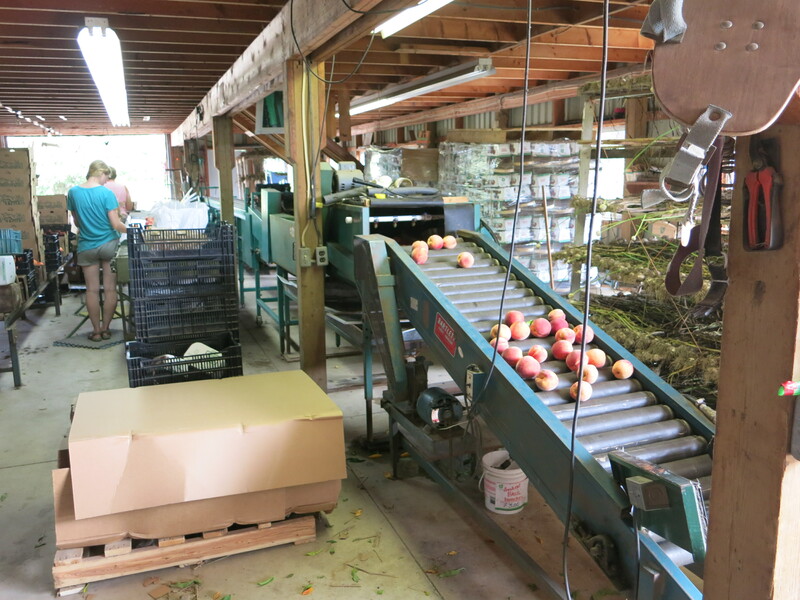 Except for a few small peach processors, there is no canning industry left in the province. The last canner shut it’s doors in 2008 sending production overseas. Any canned peaches on our supermarket shelves now come from other countries. Babygolds & other similar clingstone varieties that were grown for the canning market have now been mostly removed and replaced with other kinds of peaches (or grapes). Peaches can be canned, frozen, made into jam, and used in baking (think peach pie, peach tarts, peach cake…), smoothies & milkshakes, ice cream … and of course eaten fresh! No matter how you use them – Peaches taste great! Peaches, kale, sweet peppers, tomatoes, onions, cucumbers. Peaches continue to increase – in flavour & quality & quantity. Enjoy! The kale in your share this week is called black kale or dinosaur kale. It has smooth, dark leaves, and excellent flavour. We often eat it raw in salads, but it’s great in smoothies, soups & stews as well. All of our many kinds of sweet peppers continue to ripen. Choose from purple, yellow, green or red. Still to come are orange, brown & different shapes of red. We’re probably at the height of out tomato season now. Your box will include some lovely, big beefsteaks along with a basket of various coloured cherry tomatoes. We are getting lots of positive comments on the cucumbers & onions. 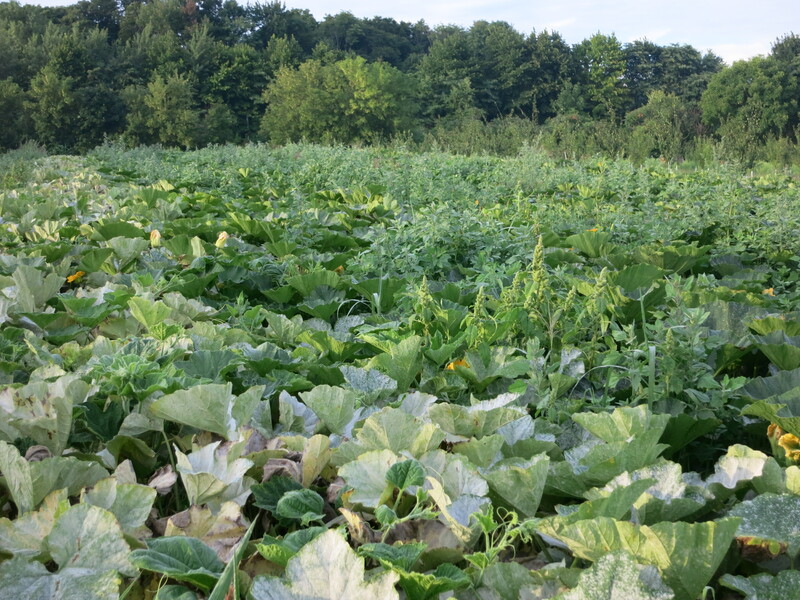 While the cucumber patch is already looking tired & dying back, there are still many weeks of onions remaining. Reminder – Please return all containers so we can use them again! 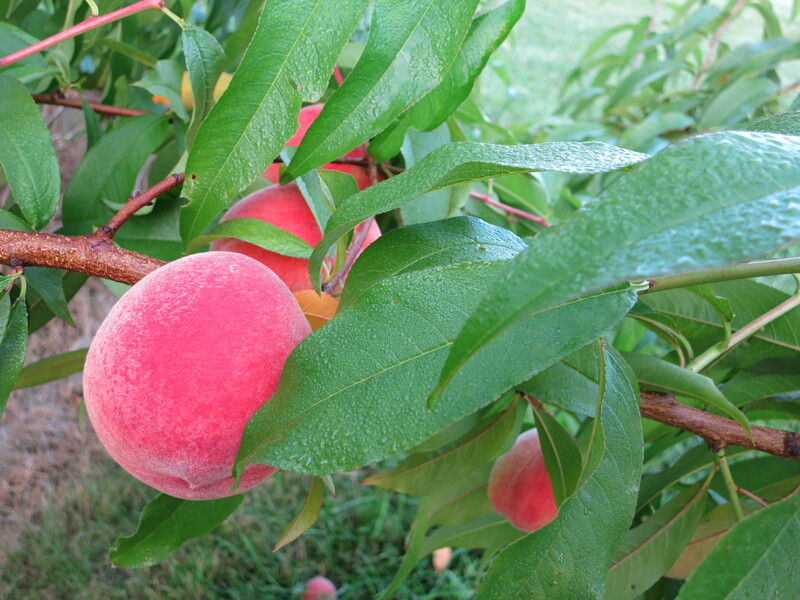 The peach season is beginning at Thiessen Farms, and we’re excited! We love everything about peaches – their looks, their smell, and especially their taste. 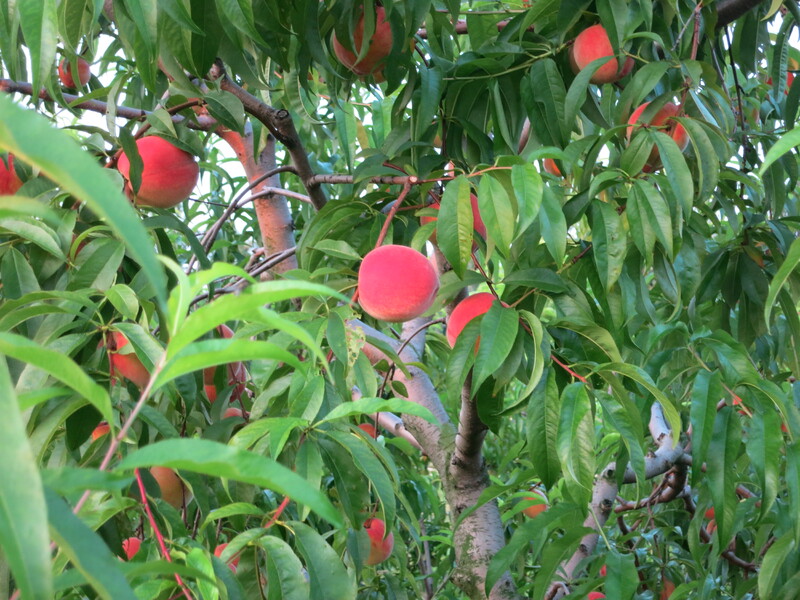 Peach season should last for about 6 – 8 weeks. 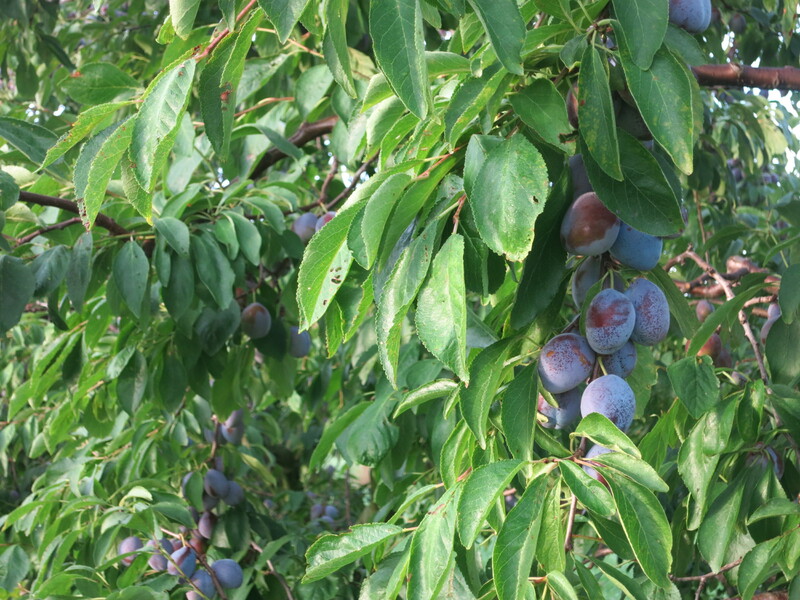 It’s starting slowly and quantities are still limited, but in another week there should be an abundance of peaches. The best peaches result from lots of sunshine together with warm days & warm nights. This season has provided much rain for the trees, and increasing sunshine & warm temperatures for the fruit. They are tasting great and we are optimistic for a good peach season! Their will be peaches in your share this week – mostly seconds or #2s. These early peaches have a lot of insect bites, bruises & soft spots. They aren’t the prettiest, but they sure taste great! The quantity & quality of the peaches should increase next week. The first of the sweet peppers are ripe – beautiful purple, pale yellow, and bright green! 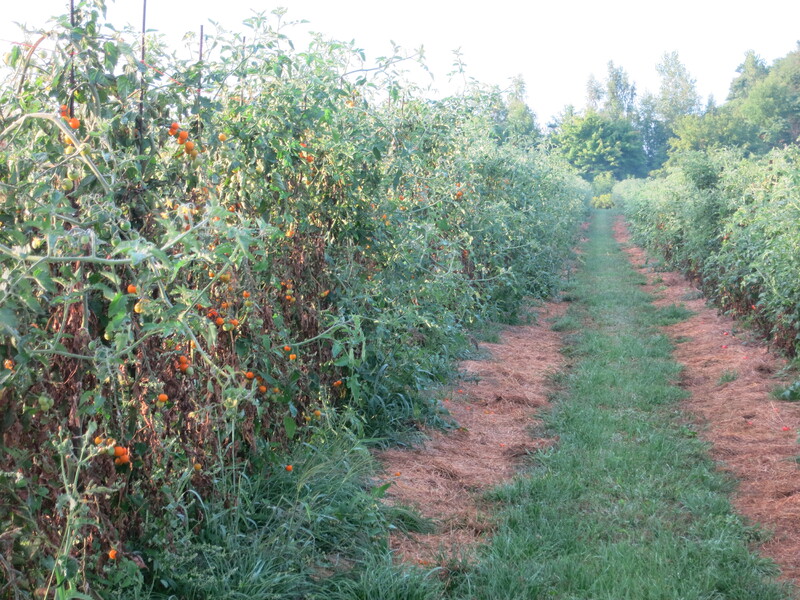 Tomatoes are coming on strong now – big, red beefsteak and cherry tomatoes in all colours. The onions are continuing, and getting a bit larger each week. Cucumbers will be in your share again this week – green ones and white ones. They both taste the same, but the green cucs are juicier, while the white ones – called “Silver Slice” – are slightly firmer & crisper. We are pleased that the beans recovered nicely from all the rain we had a week ago. This first planting is almost done, but the next patch will soon be ready. The third planting we had to fence off, to keep the rabbits from devouring them – it worked & they are coming along nicely. Lorie will pick beets Tuesday morning. They are looking good, but she won’t know the quantities until she is picking. Here’s hoping there will be lots! 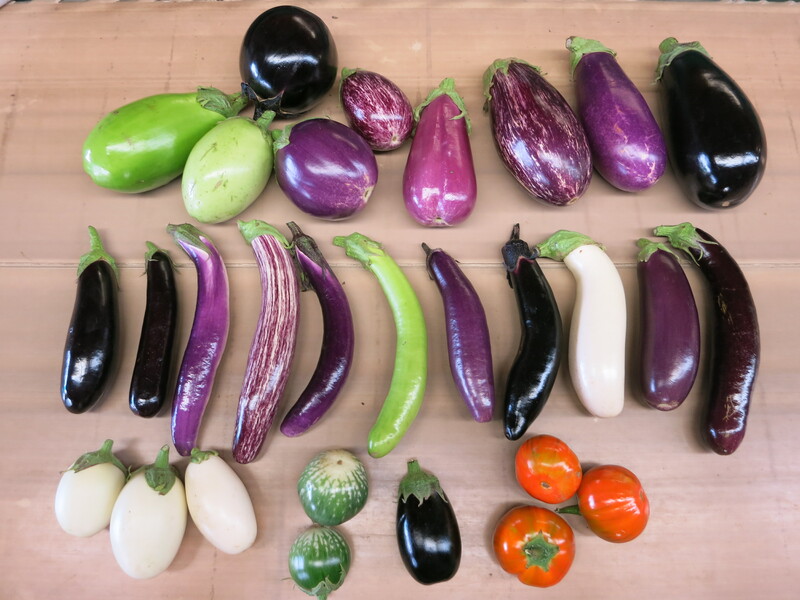 Our eggplant is incredible this season (see pictures below)! There will be lots available as an extra for those who want some. 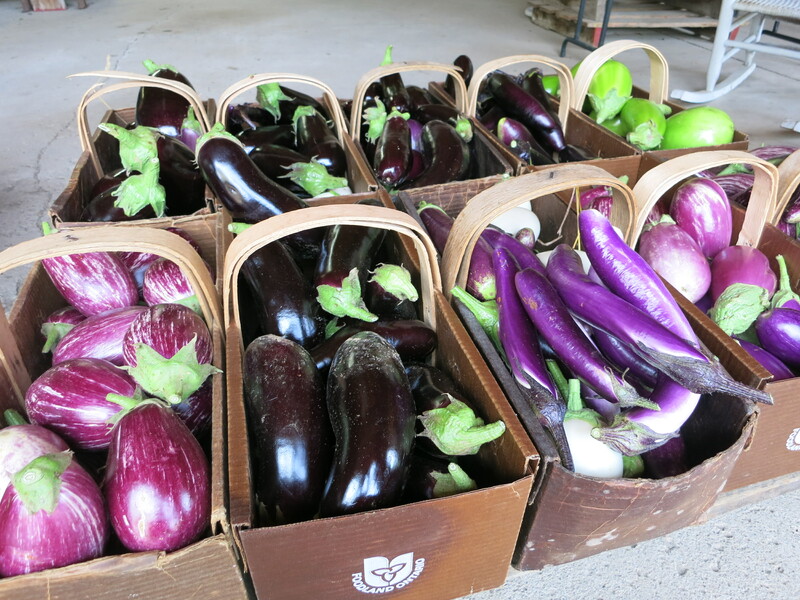 Sometimes we are able to offer a fruit or vegetable as an extra (eggplant this week). It could be an extra because we don’t have enough of it for everyone, or conversely that we have an abundance of that crop (think peaches last season). Or sometimes if we know it is not a vegetable liked by many, we will offer it as an extra so only those who will eat it, take it. Regardless of the reason, we are pleased when we can offer something extra to enhance your share. However we ask that you only take enough for your own family’s use – not for other relatives or friends. 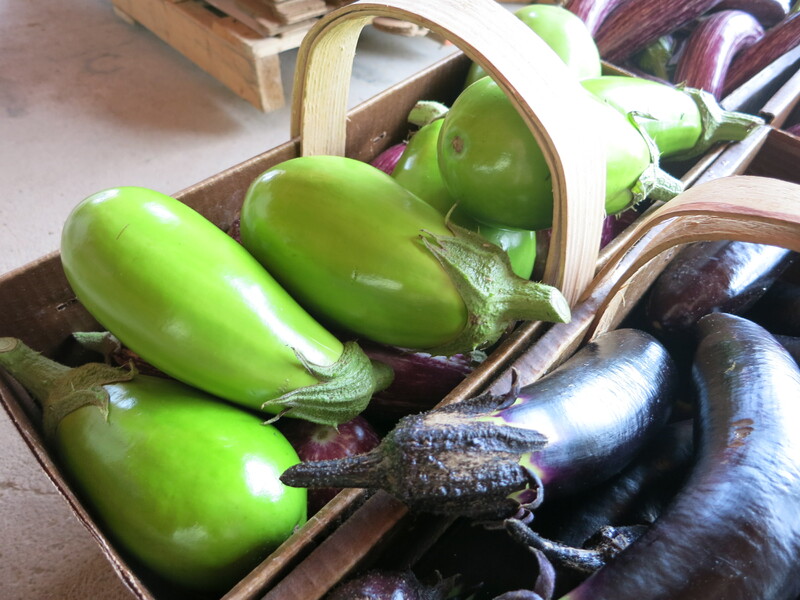 Our favourite eggplant recipe – I shared it last year but here it is again. 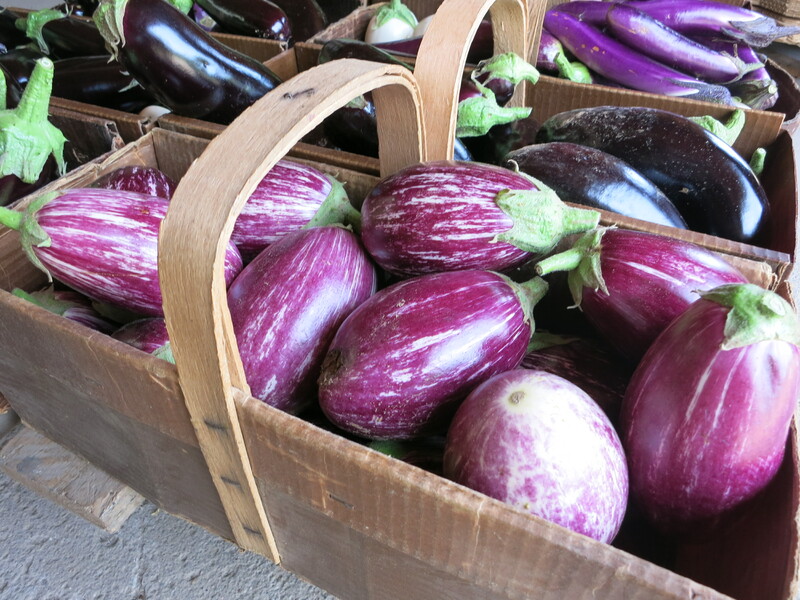 Coarsely chop your eggplant into small pieces – a little bigger than ½ inch. Mix together in a bowl with some olive oil – enough to thoroughly moisten the vegetables. Spread on a cookie sheet and crush some fresh garlic on top – a couple of cloves at least. Sprinkle with salt & pepper and some fresh herbs such as thyme or oregano. Bake in the oven at 350 for 1 – 1 & 1/2 hours. Grate some cheese over the dish before serving. 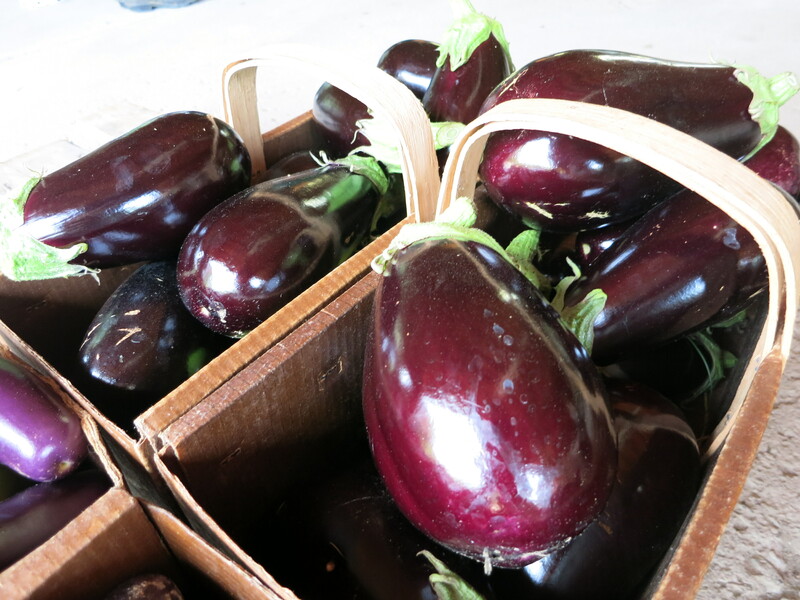 We make this recipe with whatever eggplant & tomatoes we have leftover from market or CSA. Exact quantities are not important – use whatever you have.